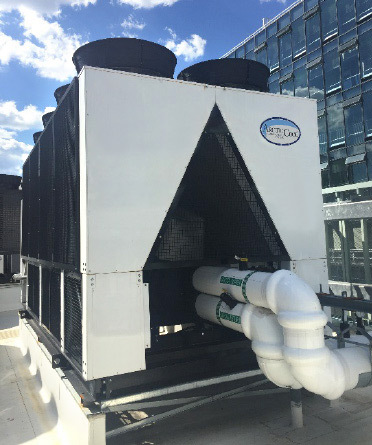 The Arctic Chiller Group can provide modular, air and water cool chiller solutions for existing facilities. Arctic Chillers utilize world leading compressor technology in both air and water cool machines. The Danfoss Turbocor® compressor is revolutionary by using magnetic baring levitation technology to eliminate the need for oil for lubrication in the compressor. There are only two moving parts in the compressor and virtually no friction, this results in exceptionally high efficiency at a very low noise. When replacing existing oil-based compressors, the electrical draw of the Arctic Chiller is substantially lower for the same tonnage. There are energy saving incentives available to offset the capital cost of this new infrastructure. Air cool chillers can be sized up to 450 tons, water cool 1,500 tons. Multiple compressors can be used on each chiller in order to provide an increased level of redundancy. Compressor change-outs can be completed in under three hours, while the remaining compressors remain operational on the same chiller. The efficient design of the Arctic range of chillers always results in a reduced footprint, ensuring the new chiller will fit into the existing location.